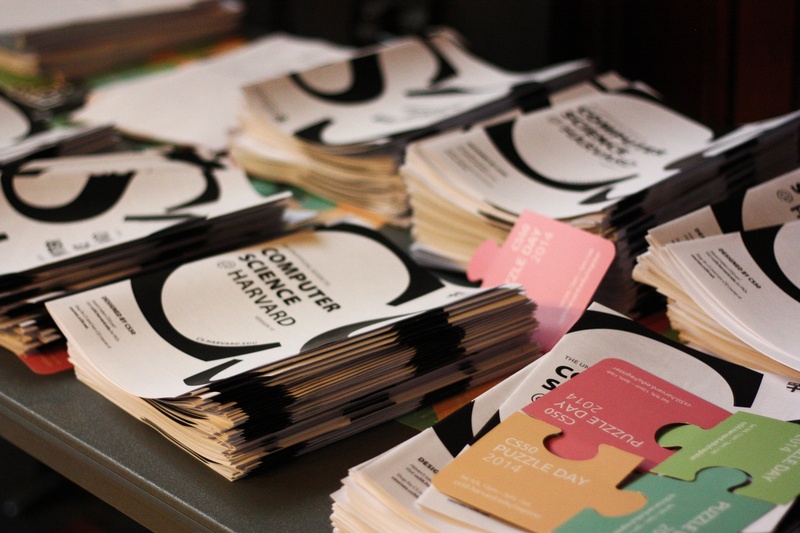 Stacks of paper guides to computer science at Harvard and puzzle pieces advertising the annual CS50 Puzzle Day decorate the tables outside Sanders Theater at the first lecture of the year. UPDATED: November 30, 2014, at 9:15 p.m.
Computer Science 50 will officially expand to Yale in the fall of 2015, the popular introductory course’s instructor, David J. Malan ’99, confirmed this week. Harvard’s approval was the final step necessary for a joint Harvard-Yale CS50 venture, which was first reported in The Crimson in October and approved by Yale faculty in early November. Yale students will be able to watch CS50 lectures streamed live or as archived videos, with sections and office hours taking place in New Haven, Malan said during a course lecture on Monday. In addition, Malan wrote in an email to The Crimson that Yale will recruit a team of teaching fellows and course assistants to aid Yale computer science professor Brian Scassellati in creating a course with a similar structure to that on Harvard’s campus. Jason C. Hirschhorn ’14-’15 will take on a full-time position at Yale to oversee the course alongside Scassellati, Malan wrote. According to Hirschhorn, Malan approached him a few months ago when conversations between Malan and Yale Computer Science Department Chair Joan Feigenbaum ’81 about a joint course were just beginning. Though Hirschhorn said “details are still being worked out,” students at Yale can expect a similar version of CS50 implemented on their campus. The CS50 employment website currently does not list any open positions in New Haven, though the course website’s front page advertises potential opportunities to “join the staff” of CS50 in Cambridge or New Haven. 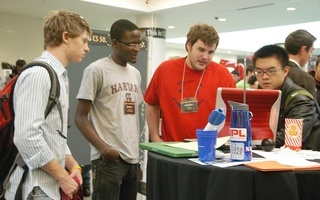 Yale students will also be invited to partake in CS50’s annual Puzzle Day in September and its hackathon in December. Malan wrote he anticipates “epic” CS50 fairs at the end of the fall 2015 semester displaying Yale and Harvard students’ work. Yale faculty had already “overwhelmingly” approved of a joint Harvard-Yale Cs50 venture at a meeting in early November, according to Feigenbaum, leaving the proposal in the hands of Harvard’s faculty to approve. According to Feigenbaum, Malan first emailed her over the summer to propose the joint course. Malan had previously declined to give specifics about the proposal. 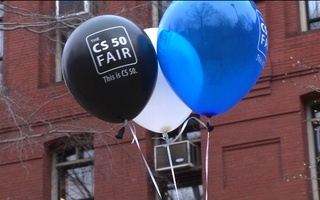 CS50’s website’s color scheme has now changed from its regular bright pastels to Harvard- and Yale-inspired reds and blues. 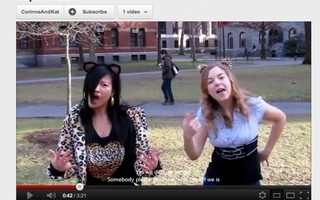 The website also features a Youtube video titled “Movin’ Right Along,” in which two muppets—one clad in a red CS50 t-shirt—drive from Harvard Yard to Yale’s campus. The announcement of the new venture comes just days after the 131st Harvard-Yale football game, which Harvard clinched with a final score of 31-24. Less than a week after Computer Science 50 Lecturer David J. Malan ’99 announced that the class would switch to a satisfactory/unsatisfactory grading system, administrators and teaching fellows have expressed reservations about Malan’s plan. Enrollment in the introductory class Computer Science 50 jumped 56 percent from last year—from 337 students last fall to 525 this year. These enrollment numbers place CS50 as the fourth largest undergraduate class offered at the College. Students and professors alike say that the image of the computer scientist has changed along with the growing popularity of the field.